In collaboration with the FSM Department of Health and Social Affairs (DH&SA) of the Government of the Federated States of Micronesia, the Project for System Improvement of Expanded Program on Immunization in the Pacific Region (J-PIPS) conducted an In-Country training on Vaccine management and Cold Chain maintenance in Chuuk State from 23rd to 26th September 2013. Japanese Government, through Japan International Cooperation Agency (JICA), conducted “The Project for Strengthening the Expanded Program on Immunization (EPI) in the Pacific Region” from February 2005 to February 2010 for a period of 5 years, targeting 13 countries, to enhance human capacity development for Vaccine Management, Cold Chain maintenance, and EPI sharp waste management. JICA has immensely contributed to the immunization programme under the J-PIPS framework through provision of equipment, supporting J-PIPS workshops, and regional and domestic training program in each country. In terms of training, a total of 83 EPI Nurses and 54 Cold Chain Technicians from the PICs were trained. However, despite of all efforts, the fact still remains that each countries still struggle to improve the child mortality rate. Therefore, the Government of Japan decided to continue human resource development through establishment of the Project for System Improvement of Expanded Programme on Immunization in the Pacific Region (J-PIPS Project Phase 2) from February 2011 to January2014. 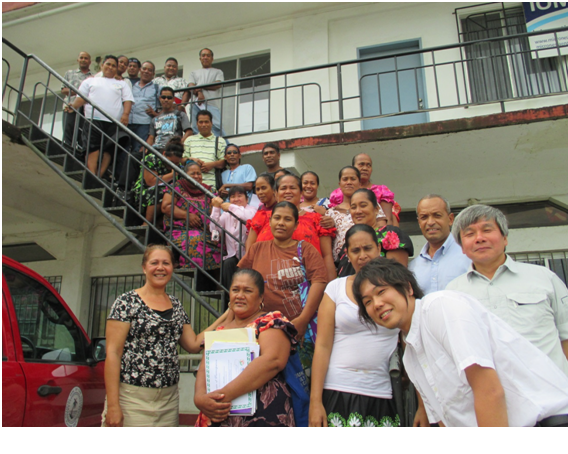 The main purpose of In-Country training in Chuuk State is to update and share the knowledge and skills on Vaccine Management and Cold Chain Maintenance with health workers and cold chain technicians. Twenty four (24) health workers and three (3) technicians in Chuuk attended the workshop aggressively to improve their capacity, and participants were able to acquire new knowledge and skills in Vaccine Management and Cold Chain Maintenance to give every child better health services, especially in the field of immunization which is to protect children from life-threatening diseases. On September 23, the World Health Organization (WHO) convened the 5th Pacific NCD Forum in Auckland, New Zealand under the specific aim of fostering Political Commitment to Resilient Action in curbing Non-Communicable Diseases (NCD) proliferation in the Pacific. Co-chaired by The Federated States of Micronesia (FSM) and Samoa, the forum was one in a series of annual events for sharing information and building leadership consensus on region-wide initiatives and targets. This year’s forum participants reviewed progress made in certain countries on Salt Reduction Initiatives and the Package of Essential Noncommunicable disease interventions for primary health care and Tobacco Control. The forum also focused on the role of the department of health in building social and political consensus toward the adoption of national NCD targets. At the end of the Forum, participants agreed on further steps to be undertaken and the roadmap toward achieving a reduction of 25% in mortality rate by 2025 through cost effective interventions. 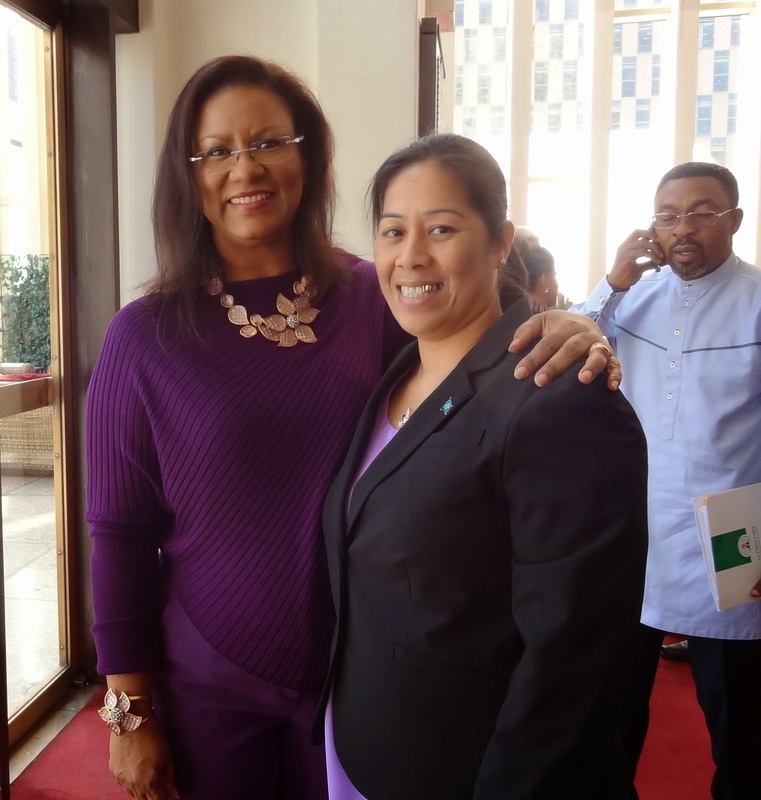 The WHO forum brought in participants from all the Pacific Islands. The FSM was represent by the Assistant Secretary of Health and Social Affairs, Mr. Marcus Samo, and the FSM NCD Program Coordinator, Mr. Kippier Lippwe. FSMIS (September 27, 2013): The new Compact fund distribution formula in the FSM through Congressional Act No. 18-12 has become a public law (PL No. 18-12) pursuant to Article IX Section 22 of the FSM Constitution. The Congressional Act changes the distribution formula of Compact funds by reducing the share of the National Government from 10% to 5% and increasing those of the States. Congress passed the new formula as Congressional Act No. 18-12 on September 14, two days after opening the Second Regular Session. In a transmittal letter of September 27 to FSM Speaker Dohsis Halbert signed by Vice President Alik L. Alik, some “practical difficulties” and defects of the new formula were brought up, while also highlighting that the Congressional Act itself “is clearly deficient”. One defect in the Congressional Act referred to in the letter to Speaker Halbert was that the formula, originating from an EPIC Resolution #2005-3-01, as well as certain languages of Title 55 Sections 303 and 306 of the FSM Code relate to a distribution inclusive of ALL Compact grants. Yet, although not supported by the language of the amending Act itself, Speaker Halbert on September 25 indicated that the intent of Congress was not to include Supplemental Education Grant in the new formula. Hence, there appears to be a lack of clarity on what the intent of Congress is. At the very least, the amendment changes established official action on the proposed budget concurred to by Congress as previously shown. Referring to the decision to suddenly implement a new distribution, the letter also emphasized how such distribution is a disruptive fundamental change to works developed over months of planning and consultation. Congress has been urged to “revisit the legal defects” and “correct them as soon as possible”. Unless extended, the 20-day regular session will end on Tuesday, October 1st. 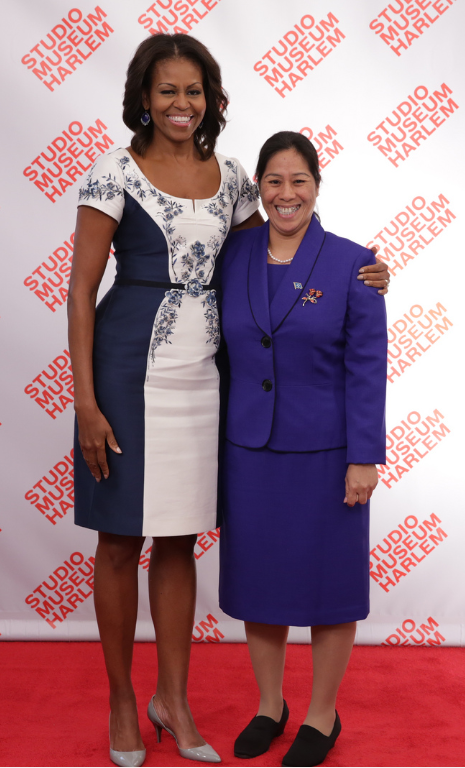 New York, NY (24 September 2013) – Along with about forty other spouses of world leaders, FSM First Lady Emma Nelson Mori attended a luncheon hosted by Mrs. Michelle Obama on the occasion of the opening of the 68th session of the United Nations General Assembly. The event was held at the Studio Museum in Harlem, a venue chosen because it evokes the historical struggle of African-Americans and reflects their stories of triumph as well as showcasing the vibrancy of the artists in this neighborhood. When Mrs. Mori arrived at the museum, she was met by a U.S. Protocol Officer and shortly thereafter greeted by Mrs. Obama, who she had met before on two other occasions, once the night before at a reception at the Waldorf Astoria Hotel and once on a previous occasion. Before lunch was served, Mrs. Mori and other first ladies from the Pacific—including Mrs. Lieom Loeak of the Marshall Islands, Mrs. Louisa Waqa of Nauru, Madam Meme Bernadette Tong of Kiribati, and Mrs. Marie Louise Milne of Vanuatu—enjoyed a guided tour of the museum as a small group. During the tour, Mrs. Mori met Mrs. Roman Tesfaye of Ethiopia for the first time. The ladies had lunch in the main gallery, during which Mrs. Obama gave a brief speech about the important roles of education and the arts. She commented that many of the women in the room had contributed significantly to advancement of women’s education and other important causes in their countries and internationally. Her remarks were followed by performances by Broadway star Audra McDonald and the Dance Theater of Harlem. In addition to Mrs. Tesfaye of Ethiopia, it was Mrs. Mori’s first introduction to a number of other first ladies, including Mrs. Linda Rama, wife of the Prime Minister of Albania, with whom Mrs. Mori conversed at lunch, Mrs. Eloise Gonsalves of Saint Vincent and the Grenadines, and Mrs. Sandra Elisabeth Roelofs of Georgia. Other ladies who she saw at the event were already her friends and acquaintances, such as the wives of the Pacific island countries mentioned above and Mrs. Bronagh Key of New Zealand. New York, NY (September 24, 2013): As part of his heavy program of activities while in New York for the 68th Session of the United Nations General Assembly (UNGA), President Manny Mori met with a leadership delegation of the American Jewish Committee (AJC) led by Ambassador Peter Rosenblatt to share ideas and exchange views on issues of common interest. The annual FSM-AJC meeting has become a recurrent and prominent item on the President’s agenda in the margins of the UNGA in recognition of AJC’s informal but active facilitative role in what has been described as a Triangular Partnership involving the FSM, Israel, and the United States. With chapters in scores of cities around the world, the American Jewish Committee is an advocacy group for Israel. The organization is also known for its promotion of democracy, the rule of law, and humanitarianism and human rights. President Mori reiterated the importance of the FSM’s special friendship with the US and Israel. Ambassador Rosenblatt, who was the chief US negotiator for the Compact of Free Association during President Jimmy Carter’s administration, expressed AJC’s profound appreciation for the FSM Government’s support of Israel, especially in the fora of the UN, and Israel’s friendship with the Micronesian people. Rosenblatt asked President Mori what he considered to be the FSM’s top-priority challenge. “Climate change, sea-level rise in particular,” Mori promptly responded, further elaborated on the “specific food security challenges” that the low–lying islands of the FSM are already facing. President Mori also identified three specific challenges with respect to the Amended Compact that necessitate renewed commitment and cooperation of the parties to the treaty to address. One of these relates to the requirement that the US Executive Branch must conduct 5-year reviews of applicable provisions of the Amended Compact and transmit its report to the US Congress. The aim of the 5-year reviews is to ensure that the FSM attains self-reliance by identifying unanticipated obstacles or emerging needs including suggested solutions. President Mori’s concern is that the first Compact Review, which is required by US statute, seems to have been overlooked. Another concern raised was the poor performance and underfunded corpus of the Trust Fund created by the Amended Compact. President Mori stated that the “projections used for the Fund were too ambitious right from the start.” The level of earnings that is anticipated to be accrued by 2023 will not be enough to provide adequate public services and support economic growth. The economic and financial provisions of the Amended Compact are stipulated to end in 2023. Flexibility in the “Re-Balancing” of Compact sector grant allocation is the third challenge that President Mori feels should be addressed as well. He reiterated that the FSM supports the designation of education and health as the two top objectives of the Compact in terms of grant allocation. Yet, he believes that the collective experience of the first ten years of the 20-year Amended Compact funding demonstrates the imperative of “re-balancing” funding allocation to also take into consideration infrastructure, growing the economy and tax base, for instance. “We must recognize the reality that we have seen in the first half of the Amended Compact,” President Mori urged. In looking forward to addressing these challenges and the stipulated termination of the Compact sector grants, Mori was pleased in informing the AJC representatives about the establishment of the Committee on 2023. The Committee is comprised of members from the Executive Branches and Legislative Branches of both the National and State Governments. In the spirit of the Triangular Partnership, President Mori also shared his vision for a comprehensive cooperation arrangement between the FSM and the State of Israel. Expressing his appreciation with the interest that Israel has shown in the welfare of the Micronesian people, Mori suggested that the two countries seize the reality of the convergence of FSM’s needs and Israel’s area of renown expertise to design and tailor a cooperation arrangement that would take into consideration the FSM’s priority need areas such as food security (i.e., agriculture/farming, aqua-culture/fish farming, sustainable drinking water supply for the remote and rural areas) and alternative/renewable energy, as well as human resource development and humanitarian assistance cooperation. Through Ambassador Rosenblatt, President Mori thanked the AJC for its long-standing and ongoing support. He encouraged the AJC to continue its support of the Triangular Partnership. Rosenblatt was accompanied to the meeting by the AJC Pacific Islands Task Force Chair, Marlene Altman; Board of Governors members Bill Seigel, and Zev Wexler, as well as seven other members: Shira Lowenberg, Lyon (Lenny) Roth, Leonard Wien, Andy Hall, Jeff Eisenberg, Suzanne Lasky Gerard, and Joanna Lieberman. Sitting with President Mori were Secretary of Foreign Affairs Lorin S Robert; FSM Permanent Representative to the UN Ambassador Jane J Chigiyal; FSM Ambassador to the US Asterio R Takesy; Deputy Permanent Representative Jeemer S Lippwe; and Deputy Chief of Mission James A Naich. The meeting took place at the new FSM Permanent Mission in New York City. 23 September 2013 New York City – At a luncheon event today, President Manny Mori welcomed President Christopher Loeak of the Republic of the Marshall Islands and President Tommy Remengasau of the Republic of Palau to the new offices of the FSM Mission to the United Nations. The three Presidents and a number of ministers, including FSM Secretary of Foreign Affairs Lorin Robert, are currently in New York to attend the 68th Session of the United Nations General Assembly. Each year, the second week of the session, which is known as the General Debate, is filled with many high level thematic meetings. This year these include high level forums on Disability, Development and progress toward achieving the Millennium Development Goals. Throughout the week, almost all of the world’s Heads of State and Government will also deliver speeches to the General Assembly. For a change of pace from formal meetings, the lunchtime gathering was meant to be a relaxing event for the guests to meet and enjoy each other’s company. A group of Micronesians performed a well-known Chuukese song about coming together with family and friends, with accompaniment on the ukulele. Also in attendance at the lunch from FSM were First Lady Emma Mori, Ambassador to the United Nations Jane Chigiyal and Ambassador to the United States Asterio Takesy, along with his wife Justina, as well as Deputy Permanent Representative Jeem Lippwe and Deputy Chief of Mission James Naich. Notable guests included RMI Minister-in-Assistance Tony de Brum, RMI Foreign Minister Philip Muller, Palauan Minister of Finance Elbuchel Sadang, RMI Ambassador to the UN Amatlian Kabua, Palauan Ambassador to the UN Caleb Otto, Palaun Ambassador to the United States Hersey Kyota, and RMI Ambassador to the United States Charles Paul. Father Bruce M. Roby, a Micronesian priest in the US, said grace and prayed over the gathering.